This article is about the theologian and precursor of Lutheranism. Martin Luther (10 November 1483 – 18 February 1546) was a German priest and professor of theology who initiated the Protestant Reformation. Strongly disputing the claim that freedom from God's punishment of sin could be purchased with money, he confronted indulgence salesman Johann Tetzel with his Ninety-Five Theses in 1517. 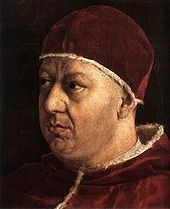 His refusal to retract all of his writings at the demand of Pope Leo X in 1520 and the Holy Roman Emperor Charles V at the Diet of Worms in 1521 resulted in his excommunication by the pope and condemnation as an outlaw by the emperor. His translation of the Bible into the language of the people (instead of Latin) made it more accessible, causing a tremendous impact on the church and on German culture. It fostered the development of a standard version of the German language, added several principles to the art of translation, and influenced the translation into English of the King James Bible His hymns influenced the development of singing in churches. 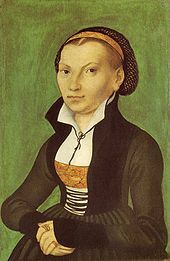 His marriage to Katharina von Bora set a model for the practice of clerical marriage, allowing Protestant priests to marry. In his later years, Luther became strongly anti-Judaic, writing that Jewish homes should be destroyed, their synagogues burned, money confiscated and liberty curtailed. These statements have made Luther a controversial figure among many historians and religious scholars. 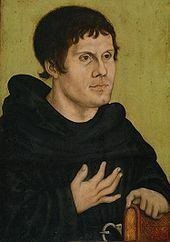 Martin Luther was born to Hans Luder (or Ludher, later Luther) and his wife Margarethe (née Lindemann) on 10 November 1483 in Eisleben, Germany, then part of the Holy Roman Empire. He was baptized as a Catholic the next morning on the feast day of St. Martin of Tours. His family moved to Mansfeld in 1484, where his father was a leaseholder of copper mines and smelters and served as one of four citizen representatives on the local council. The religious scholar Martin Marty describes Luther's mother as a hard-working woman of "trading-class stock and middling means" and notes that Luther's enemies would later wrongly describe her as a whore and bath attendant. He had several brothers and sisters, and is known to have been close to one of them, Jacob. Hans Luther was ambitious for himself and his family, and he was determined to see Martin, his eldest son, become a lawyer. He sent Martin to Latin schools in Mansfeld, then Magdeburg in 1497, where he attended a school operated by a lay group called the Brethren of the Common Life, and Eisenach in 1498. The three schools focused on the so-called "trivium": grammar, rhetoric, and logic. Luther later compared his education there to purgatory and hell. 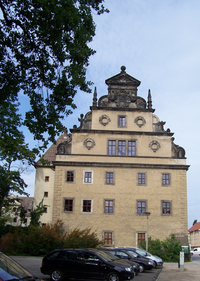 In 1501, at the age of nineteen, he entered the University of Erfurt — which he later described as a beerhouse and whorehouse. The schedule called for waking at four every morning for what has been described as "a day of rote learning and often wearying spiritual exercises." He received his master's degree in 1505. In accordance with his father's wishes, Luther enrolled in law school at the same university that year but dropped out almost immediately, believing that law represented uncertainty. Luther sought assurances about life and was drawn to theology and philosophy, expressing particular interest in Aristotle, William of Ockham, and Gabriel Biel. He was deeply influenced by two tutors, Bartholomäus Arnoldi von Usingen and Jodocus Trutfetter, who taught him to be suspicious of even the greatest thinkers and to test everything himself by experience. Philosophy proved to be unsatisfying, offering assurance about the use of reason but none about loving God, which to Luther was more important. Reason could not lead men to God, he felt, and he thereafter developed a love-hate relationship with Aristotle over the latter's emphasis on reason. For Luther, reason could be used to question men and institutions, but not God. Human beings could learn about God only through divine revelation, he believed, and Scripture therefore became increasingly important to him. He later attributed his decision to an event: on 2 July 1505, he was on horseback during a thunderstorm and a lightning bolt struck near him as he was returning to university after a trip home. Later telling his father he was terrified of death and divine judgment, he cried out, "Help! Saint Anna, I will become a monk!" He came to view his cry for help as a vow he could never break. 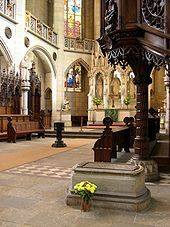 He left law school, sold his books, and entered a closed Augustinian friary in Erfurt on 17 July 1505. One friend blamed the decision on Luther's sadness over the deaths of two friends. Luther himself seemed saddened by the move. Those who attended a farewell supper walked him to the door of the Black Cloister. "This day you see me, and then, not ever again," he said. His father was furious over what he saw as a waste of Luther's education. Luther dedicated himself to monastic life, devoting himself to fasting, long hours in prayer, pilgrimage, and frequent confession. He would later remark, "If anyone could have gained heaven as a monk, then I would indeed have been among them." Luther described this period of his life as one of deep spiritual despair. He said, "I lost touch with Christ the Savior and Comforter, and made of him the jailor and hangman of my poor soul." Johann von Staupitz, his superior, concluded that Luther needed more work to distract him from excessive introspection and ordered him to pursue an academic career. In 1507, he was ordained to the priesthood, and in 1508 began teaching theology at the University of Wittenberg. He received a Bachelor's degree in Biblical studies on 9 March 1508, and another Bachelor's degree in the Sentences by Peter Lombard in 1509. On 19 October 1512, he was awarded his Doctor of Theology and, on 21 October 1512, was received into the senate of the theological faculty of the University of Wittenberg, having been called to the position of Doctor in Bible. He spent the rest of his career in this position at the University of Wittenberg. 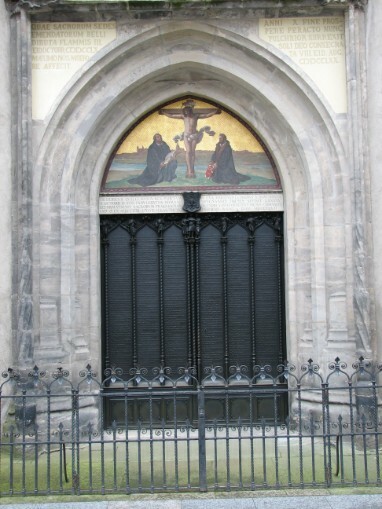 Door of All Saints' Church in Wittenberg to which Luther nailed his 95 Theses on 31 October 1517, sparking the Reformation. In 1516-17, Johann Tetzel, a Dominican friar and papal commissioner for indulgences, was sent to Germany by the Roman Catholic Church to sell indulgences to raise money to rebuild St Peter's Basilica in Rome. Roman Catholic theology stated that faith alone, whether fiduciary or dogmatic, cannot justify man; and that only such faith as is active in charity and good works (fides caritate formata) can justify man. The benefits of good works could be obtained by donating money to the church. On 31 October 1517, Luther wrote to Albrecht, Archbishop of Mainz and Magdeburg, protesting the sale of indulgences. He enclosed in his letter a copy of his "Disputation of Martin Luther on the Power and Efficacy of Indulgences," which came to be known as The 95 Theses. Hans Hillerbrand writes that Luther had no intention of confronting the church, but saw his disputation as a scholarly objection to church practices, and the tone of the writing is accordingly "searching, rather than doctrinaire." Hillerbrand writes that there is nevertheless an undercurrent of challenge in several of the theses, particularly in Thesis 86, which asks: "Why does the pope, whose wealth today is greater than the wealth of the richest Crassus, build the basilica of St. Peter with the money of poor believers rather than with his own money?" Luther objected to a saying attributed to Johann Tetzel that "As soon as the coin in the coffer rings, the soul from purgatory [also attested as 'into heaven'] springs." He insisted that, since forgiveness was God's alone to grant, those who claimed that indulgences absolved buyers from all punishments and granted them salvation were in error. Christians, he said, must not slacken in following Christ on account of such false assurances. contemporaneous evidence exists for Luther's posting of the theses. Others counter that such evidence is unnecessary because it was the custom at the University of Wittenberg to advertise a disputation by posting theses on the door of All Saints' Church, also known as "Castle Church". The 95 Theses were quickly translated from Latin into German, printed, and widely copied, making the controversy one of the first in history to be aided by the printing press. Within two weeks, copies of the theses had spread throughout Germany; within two months throughout Europe. Archbishop Albrecht of Mainz and Magdeburg did not reply to Luther's letter containing the 95 Theses. He had the theses checked for heresy and in December 1517 forwarded them to Rome. He needed the revenue from the indulgences to pay off a papal dispensation for his tenure of more than one bishopric. As Luther later noted, "the pope had a finger in the pie as well, because one half was to go to the building of St Peter's Church in Rome". of the church cast him as an enemy of the pope. Cajetan's original instructions had been to arrest Luther if he failed to recant, but he lacked the means in Augsburg, where the Elector guaranteed Luther's security. Luther slipped out of the city at night, without leave from Cajetan. 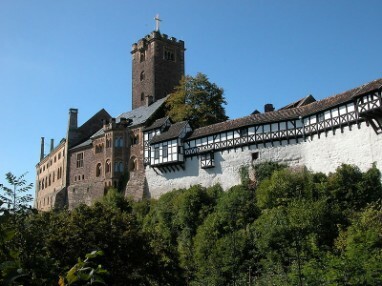 In January 1519, at Altenburg in Saxony, the papal nuncio Karl von Miltitz adopted a more conciliatory approach. Luther made certain concessions to the Saxon, who was a relative of the Elector, and promised to remain silent if his opponents did. The theologian Johann Maier von Eck, however, was determined to expose Luther's doctrine in a public forum. In June and July 1519 he staged a disputation with Luther's colleague Andreas Karlstadt at Leipzig and invited Luther to speak. Luther's boldest assertion in the debate was that Matthew 16:18 does not confer on popes the exclusive right to interpret scripture, and that therefore neither popes nor church councils were infallible. For this, Eck branded Luther a new Jan Hus, referring to the Czech reformer and heretic burned at the stake in 1415. From that moment, he devoted himself to Luther's defeat. 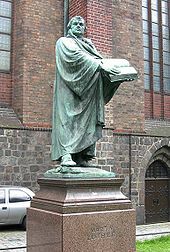 solution, but Luther, who had sent the Pope a copy of On the Freedom of a Christian in October, publicly set fire to the bull and decretals at Wittenberg on 10 December 1520, an act he defended in Why the Pope and his Recent Book are Burned and Assertions Concerning All Articles. 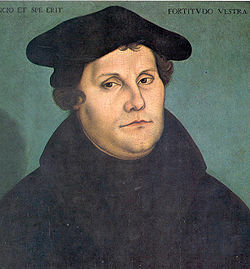 As a consequence, Luther was excommunicated by Leo X on 3 January 1521, in the bull Decet Romanum Pontificem.